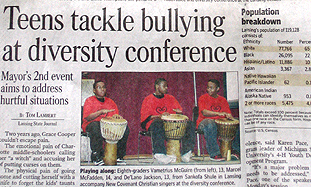 In class and online, we read a Lansing State Journal article, Teens Tackle Bullying at Diversity Conference. The article reports on a school anti-bullying conference held on March 21 in Lansing, Michigan. The conference aimed to help middle and high school students facing hurtful bullying situations. We learned that about 12,000 students from 37 schools in mid-Michigan attended workshops such as "Bullying hurts all of us." County-wide bid to tackle bullying. Do you think these kinds of conferences can be successful? How can they help students or other people who are picked on because of their race, a disability, or other difference? What do you think is the most effective way for schools or communities to stop bullying? This kind of conference is what most students need to combat bullying. It especially teaches how to tackle bullying and this is what students that are picked on need. So, students have to take advantage of this conference and also try to influence other students to take part in it. That way, it can be successful. In my opinion victims shouldn't cry inside themselves; they should talk to people instead. Also, they should ignore bullies. I think this is the most effective way to stop bullying. I think that this kind of conference is effective because students have an opportunity to talk to each other about the bullying problem. It provides students with a place for discussion. The students who are picked on can speak frankly, and that helps them to relieve the load on their mind. I think that the most effective way to stop bullying is to get students to think about the bullying problem and work together. Bullying is not only the victim's problem; it's everyone's problem. I think conferences like this one can be successful if they keep holding them, but if they have conferences only once, they will never succeed because people easily forget about it. I am glad to see this is the second one. This conference was a good chance for people to try to support victims. In my opinion, the most effective way to stop bullying is to punish the bullies severely. Since it is becoming too serious, there should also be laws against bullying. I think this kind of conference can be successful. It might let people know how wrong bullying is to students and encourage the victims. Usually students being bullied try to isolate themselves. Because they are scared of meeting people, this kind of conference gives victims a chance to interact naturally with other students. That may help them to avoid being bullied. I think the most effective way to stop bullying is to get victims and bullies to talk to each other, so they can share their thought and feelings about bullying situations and understand each other better. People says " Two heads are better than one." That means a bullying victim can't solve his problems by himself. Students and teachers have to work together to come up with the best solution. At this conference, many teachers and students were able to work together to find solutions to school bullying. That's why it was successful. If it were held more often, victims wouldn't worry so much alone. I think the most effective way to stop bullying is to make sure that parents and teachers always give an ear to victims and give them a chance to speak frankly about their experiences of being bullying and ask for advice from adults. That's what happens in a conference like this. This kind of conference is an important way to support victims of bullying because victims are usually timid people. Therefore, we have to be concerned about them. If we do not help stressed out victims, they might commit suicide or even become violent and try to get revenge. Some bullied students have even gone on shooting sprees in school. This kind of conference could help victims. Conference meetings let people know bullying is bad. Students and teachers at the conference can then learn how to help victims protect themselves from bullies. I think this kind of concern is the most effective way to stop bullying. I think that the conference for victims is one of the ways to stop bullying, but bullying is not just a problem of victims though it is very important to help victims protect themselves. It could be more important to educate bullies because most bullies don't know that bullying is such bad behavior or they have not been taught the way to interact with others. This conference must have been successful if so many students--almost 12,000--attended it. It means more and more schools, teachers and students understand that bullying is a serious problem. Don't forget, the 12,000 students are only from 37 schools in mid-Michigan. If everybody recognizes the problem of bullying and wants　to resolve it, I believe that we can eliminate it. Also, victims can see that not only are they trying to stop bullying, but also all the schools, teachers and students are behind them. The most important thing about this conference is that it can unite students at the meeting into the same group and all students can feel they are the as same as others even if they are different or have disabilities. Education is the most effective way to stop bullying. The students are correct to support the conference. It's more difficult for kids, as they reach middle school, to know how to deal with bullying, especially if they are the victim. The impact is devastating and traumatic to the victims. This conference sounds good to me, too. I really like what you wrote about victims and bullies talking to each other. Getting people to have tolerance and understand each other is very important. What other groups would benefit from conferences like this? Do you think it would be difficult to get bullies to attend? What incentives could make them want to attend? Gosh you wrote so well that it got me thinking of so many questions. Keep up the good writing. You have made an excellent observation. Educating bullies is a most important step to take. I can tell that you are a good thinker. What ideas do you have that you believe might be effective in educating bullies? I think this kind of conference is good for all students because it lets them know about bullying. Usually bystanders think that bullying is none of their business, so they don't want to intervene in a bullying incident. As a result, It is harder for victims to escape it and bullies behave more aggressively, but through this kind of conference students might understand each other. Bullies might admit to victims that they just have differences and these are not reasons for bullying. Other students will also realize it, so they may become friends. I think educating bullies is a very important step to take, too, but the way of educating is very important. If this kind of conference has many amusing programs, it may arouse students’ (including bullies, of course) interest. It lets them not only have fun but it is also educating. I think that this kind of conference can be one way to stop bullying. Everyone can concentrate upon the bullying because of it and they can know about how serious bullying is more easily than before. This conference also lets them know how bad bullying is as they take part in the conference. The best way to stop bullying is to have an experience as a victim. Students can realize more easily why we need to stop bullying. This conference is very important to stop bullying incidents. I think everyone's apathy occurs in bullying. So, this conference let people know how serious bullying is.Through this conference people will be more concerned with bullying and try to stop bullying. Not only these people but also bullies and victims can think about their behavior again. If the bullying happens because of their race, a disability, or other difference, the students' thoughts should be changed. I want to say to the bullies that these differnces are not important; for example, all people's mothers are different. I also want to tell the victims that they have to be confident because their differences make them valuable individuals. We don't need a conference. We need serious actions to be taken against bullies and serious steps to stop them. How hard is it to understand this? I find that a conference could result at nothing but good outcomes. Having a conference about bullying brings about the importance of how serious bullying is and how the problem needs to be stopped. It is crucial to shine a light on this dark cloud of bullying. A conference not only brings an audience together to share what bullying is and how we should stop it, but it also brings people and students together so that they can get together and form relationships. It is important for people to know that they are not alone in this world. 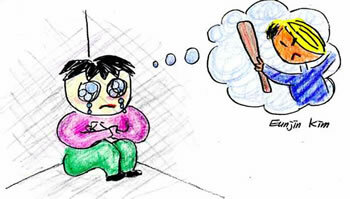 Many children are bullies or are getting bullied on a daily basis. Children who are the bullies need to learn what there victims go through everyday and how much pain they actually cause them. The children who are bullied need to learn that they are not the only ones in the world who may have a rough time everyday, this conference can bring friendships along with reconciliation. I believe awareness and togetherness is two ways that will be effective in curing bullying. All you need to stop bullies is to get a couple of older kids to wear a tee shirt that says" We Love To Bully Bullies" Go around looking for kids who are doing the bullying and bully the heck out of them. Being a vigilante in this case would do the job. Just make sure you don't get carried away. NO this is all NO this is all wrong.You are going to make the bully mad. Hit him and run, for real! Run, run where, how many days is the child going to run? wrong wrong wrong. Happy slapping—a new kind of bullying?